Clean your closets, cash in your pockets! 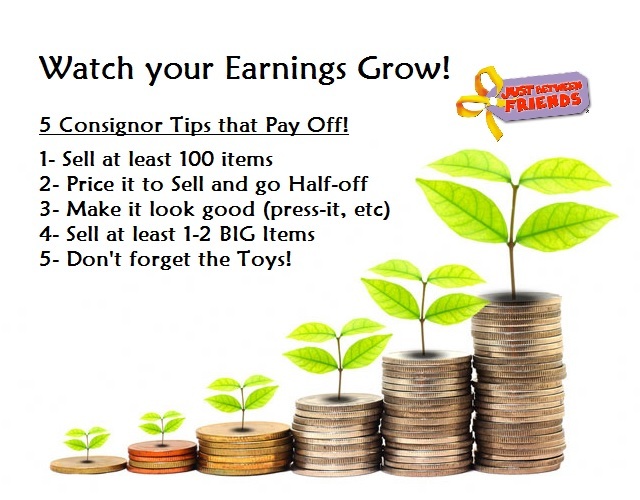 Average consignor checks are over $300! Just Between Friends is run by consignors, shoppers and we love and need YOU! The JBF Team helps with everything from handing out flyers before the event to organizing merchandise during the sale to setting up & breaking down the event. For this reason, we reward our Team. 1. Login or create a new account, and check the "consignor" box for our event. *If this is your first visit, you will be assigned a consignor number which is a unique selling number just for you. See this number at the top of your JBF Profile. 2. If you have time to help out during the sale with us, we'd love you! Just check the Team Member box as well when you register and it will open the scheduler to choose a shift. 3. After you register, you will receive an email confirmation. This will have your consignor number and indicate how you have decided to participate. 4. To start tagging: In the red taskbar of your profile, click the link for "Tagging" to be taken to the tagging site. This site is open 24/7/365 for tagging! 5. Look over the details below on what to sell and selling tips. Join the Facebook Consignor Help Group and utilize the group to help you along as you go. 6. Attend a New Consignor Meeting! They are FREE and open to anyone to attend. Classes are informal and Topics include: Tagging, Merchandising, review of myjbftags.com, and selling tips. Email me if interested. Safety pins: Please use 1" (No. 1) or larger safety pins: no straight pins or small pins. What to bring: We sell ALL items related to kids, teens, maternity and Family items!!! Our Next Sale is a Spring/Summer- Click Here for our Selling Guidelines on what is accepted. Spring/Summer/Fall: Spring, Summer or Fall clothing and outdoor toys. No Winter or Holiday themed clothing or snow toys. Fall/Winter/Spring: Fall, Winter clothing and outdoor toys. No Sundresses or Tank Tops in sizes 0-12 months. All Season Sale: All items are accepted. Items out of season, however, will be placed on lower bars or to the back of tables pending sell through on seasonal items. Winter, Toy and Holiday Sale: Toys and Winter & Holiday clothing are accepted. In addition to our normal assortment gift giving items and holiday clothing and decor are also accepted. Toy & Holiday Sale: Toys and Holiday clothing are accepted. In addition to our normal assortment gift giving items and holiday clothing and decor are also accepted. Children's clothing sizes 8 and up and maternity must be on adult sized wire or plastic tube hanger and pinned to the hanger so your item won't end up on the floor. Hangers can be found at discount stores, dry cleaners, or through JBF. For a complete list of where to find no or low cost hangers, please click here. Tag Location: Attach tag with a safety pin to the tag or a seam of the shirt in the upper right side or upper right front of pants. You can punch a hole at the top of the tag to make it easier to slide the safety pin through. **If you use a tag gun please insert the gun through the underarm seam or the tag of shirts or waistband of pants. The gun needle must go through a seam, NOT through part of the clothing (to avoid making a hole or tear in the clothing). Also, pull on the tag to make sure it is properly secured and will not come off easily. We cannot accept clothing with holes due to tagging guns..
Safety pin clothing sets securely with pants hung on the backside of the shirt/hanger so both pieces can be viewed without unpinning them. Safety pin through BOTH pieces AND through the hanger (this will prevent pants from weighing down the shirt and causing a possible tear or fabric distortion). We Have a Recommended $3 Rule for all hanging clothing. If your item does not merit the $3 price, we recommend that you pair 2-4 pieces together on a hanger to bring the price up to $3. Maternity Clothes have a tendency to fall off hangers. Please secure the tops with safety pins since they have a tendency to fall off the hanger. All pants must be pinned at the waist to the top of the hangers so shoppers can see them easily. Pants folded over hangers will not be accepted. Bottles, small toys, bows, socks, etc. must be in clear Ziploc bags with the tag attached to the inside or outside of the bag. Use clear packing tape for securing the bags closed. This prevents 'little' hands from reaching in. Bibs should be pinned together. Please be aware of our goal....to be the BEST in the consignment business. All shoes will be inspected and must be in new or very gently used condition. Be PICKY on shoes! Shoes with dirt, scuff marks or overly worn will not be accepted. Secure shoes together and tags with zip ties or string. "Laminate" top of tags with packing tape, punch hole though taped portion of tag (not too close to the edge so it doesn't rip out), zip tie/string through hole in tag and round part of shoe (buckle, heel pull, shoe lace grommet. etc.). Please bring toys that are in full working order and do not appear on any recall list. Toys with missing pieces and do not function properly cannot be accepted. Please do not bring any toys you would not want to purchase yourself. Batteries included. Any item with batteries that is not working will be pulled from the store and returned to the consignor. Corroaded batteries are unacceptable. All toys must be clean. Games and puzzles should have all pieces and be tied or taped closed. Wooden puzzles can be wrapped with plastic wrap so the pieces will stay in place. You will want to put a few layer in each direction. Do not tape over wooden puzzles with pictures, they will tear. Use plastic wrap on these these puzzles. Several small items can be grouped together in Ziploc bags (books, rattles, grab bags for small toys). No Happy Meal type toys. We accept stuffed toys and Animals and characters such as Elmo, Disney Themed, and other known figures. However they all must be priced to sell. Overpriced Stuffed animals will not be accepted. No Carnival or styrofoam stuffed toys. We accept all Books from Soft Toddler Books to Novels that are family friendly. Pregnancy and Parenting Books are also Accepted. Place Tags on Books with Scotch table or blue painters tape as to not damage the book. It is ok to bundle books together in a Ziploc Bag. Movies: DVDs and BluRays (VHS Tapes are accepted as long as they have their original case and are priced to sell) . DVD's must be appropriate for children no "R" or "M" ratings, please! Infant Items sell very well at JBF and we accept a large variety of all those things you needed or may have received as gift for your baby. This includes diapers, momentos, safetey items, boppys and more. We just ask that all items are cleaned, steamed and checked for recalls. Infant room decor and bedding is accepted. You are welcome to break up sets or keep them together. We do still accept bumper pads but these do not sell very well any more so price them to sell. Infant equipment includes: Car seats, strollers, high chairs, swings, exersaucers, bouncy seats, boppies, play gyms, cribs, pack and plays and bassinets. Car seats cannot be older than 5 years old. All car seats must be accompanied by a Car Seat Waiver. Due to the high number of recalls, we do not accept cribs purchased before 2012. Large toys and outdoor play equipment must be clean. Mr. Clean Magic Erasers work well on these items. Must include all pieces. Name brands sell well. All kinds of children's and household furniture will be accepted. To keep our reputation of 'only the best', JBF asks that you be very selective about the quality of your furniture. All furniture must be intact and sturdy. A great way to attach tags to funiture is with zip ties so that sticky residue from tape will not be left on the item. Mommy Mart items are those items that moms may need when raising their children! Items like stamping and scrapbooking accessories, bath items, and purses are some of the items that have been included in our Mommy Mart area. Getting it Sold-Pricing & Presentation! Pricing: You set your own price on all items. Price to sell! Generally items sell for 1/3 of the original price, depending on name brand and condition. Better brand names, unique items, or high price items usually bring more. Ask yourself "What would I pay for this item?" Please use $.50 price increments only (i.e. ; $6.00 or $6.50 rather than $6.99). Our best advice is to price your items 1/2 to 1/4 of the original retail price. First: Are you ready to get rid of this item and not look back? Often when items show up at the sale that are overpriced, it's because that mom (or the kiddo) really loved that piece. If an item really tugs at your heartstrings, put it back in the tote and move on to the items you are really ready to sell and not bring back into your house. Second: What would you pay for the exact same item? If you wouldn't be willing pay what you are asking, our shoppers won't either. Third: What is that item going for in the stores right now? 1/4 to 1/3 of retail price is a good place to start. Don't price it for more than a shopper could go buy it for new today. Some stores almost always have certain brands 50% off. That 50% off price should be considered the retail price you take 1/4 to 1/3 of, not the full marked price that nobody actually pays. •Consignors Golden Rule: Don't sell what you wouldn't buy! •We recommend using Google Shopping and Ebay to gauge market prices for second hand items. Diapers.com and Walmart.com are also great websites to visit. You can also visit the manufacturers websites to determine approximate retail value if you are unsure what you originally paid. •Hanging items have a suggested $3 minimum price. Group items together (you can put 2-3 shirts OR 2-3 pairs of pants on the same hanger) to bring the price up to $3 if need be. •Boys clothing typically sell for less than girls, so price accordingly. •Keep in mind the brand/label of your clothing and price accordingly. •We will not accept items that are grossly overpriced. Our shoppers are smart, and come to JBF to find the best stuff at the best prices, and we depend on our consignors to provide that for them. Click here for a pricing guide. This will provide a great starting point, as suggested prices are divided by brand (for clothing), and good ranges of prices for toys, equipment and more. If you have a specific piece of equipment or large item you want some advice on how to price, be sure and e-mail us the details, we'll be glad to help! Presentation: Take the time to make it look good! Iron or use a wrinkle free spray on your items. Be aware of how you bag your items and display them. The better they look the better chance they will sell! 1. Prep, price and organize your stuff at home (see details below) and bring to the sale ready to be SOLD! 3. Check in and we will provide you with a rolling rack to transport your items into the building. Following inspection, you will place all items on the sales floor. Please plan to allow 30-90 minutes for this process depending on how many items you are selling. 4. Watch your sales grow with real-time updates. It is seriously better than watching the lottery numbers roll in! Pick-up Time is June 18 or you can select to pick up your items after the Fall Sale July 30. You have a choice! 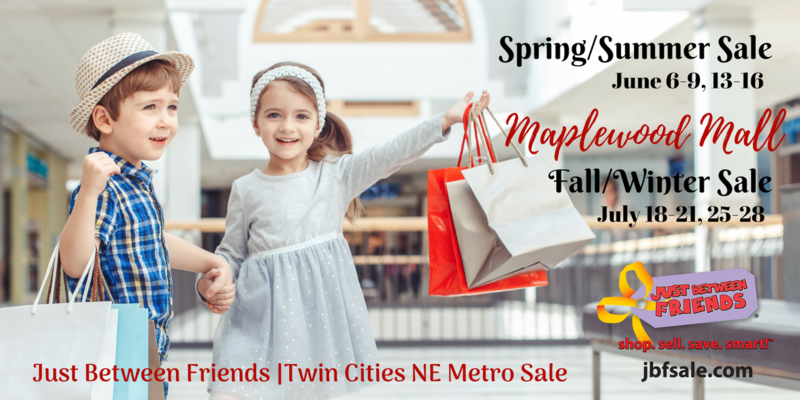 You may donate your unsold items to our charity partner, The Arc ot the Greater Twin Cities & White Bear Lake Area Education Foundation OR pick up your items. Pick up is totally painless as ALL items are sorted for you (how cool is that?). You simply check-in and walk through a series of 7 steps and check out and get your check on the spot! You may bring a wagon or laundry basket to take your items home. Plan accordingly as as pick-up is self-check-out process and the process can take anywhere from 15-30 min. *Note: Sort needs to be complete prior to pick-up so there are no early pick-ups allowed. If sort is still in process when you arrive- feel free to help out or come back a little later. 1. If you mark your items "donate", you are DONE! You do nothing except feel really great about helping needy families + there will be a link to print for your taxes on our giving back page. Your check will be mailed to you. 2. If you want your unsold items back at the end of the sale, simply come during your pre-selected scheduled pick-up time. You will need to know your consignor #. -If you are a Power Consignor (dropping off more than 300 items), and you wish to pick up your unsold items, you are required to help during our sort shift. Thank You for choosing to consign with JBF! The information on this page will help to get you started selling with JBF. We have additional links below that can be a great resource as well. Have a question? You can always email me or join our Facebook Selling Group and ask other sellers for tips on just about anything from pricing to helping out! Keep in Mind your goal & our goal is for you to make money. Just Between Friends recommends you have at least 100 items to consign or a minimum of $100 of merchandise to make it worth your time and to receive an acceptable return on your items and time. $$ Valet Tagging Information Valet Consigning Sign-up $Cash Now Information Cash-Now Waiver Why Sell with JBF?